Home Cast iron cookware What makes the Le Creuset Dutch oven so special? What makes the Le Creuset Dutch oven so special? It doesn’t get any more romantic than France, fields of lavender, red wine, country villages, cookware…and cookware? One look at Le Creuset and you will be in love. Cute little villages with stone cottages hundreds of years old dot the French countryside. I imagine these cottages fill of antiquities and charm of yesteryear. Old fashioned wholesome cooking, slowly cooked to perfection. The French passion for food is unsurpassed, likewise French cuisine is well known to be one of the world best. With great food comes great cookware and Le Creuset Dutch ovens set the standard for other companies to follow. Having some of the best cookware in the world. The French cookware brands are known for style, design and usability. Le Creuset, pronounced lə kʁøzɛ or “le cru zay” manufactures some of the finest ceramics and enamel cast iron. The cookware is the envy of many “foodies” and chefs. 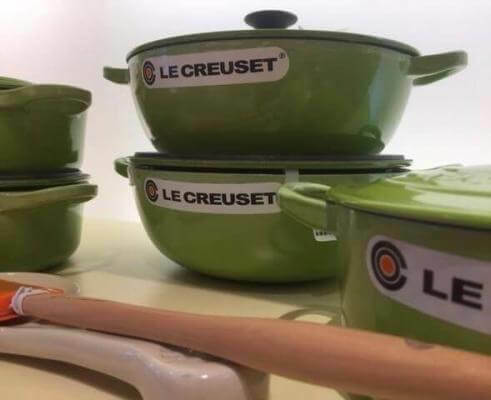 No cookware brand is more well know for their dutch oven than Le Creuset. The famous French oven or more commonly known dutch oven is Le Creusets flagship product. The enamel on the cast-iron pots are bright and radiantly coloured. The cookware is sturdy and also dependable, moreover the enamel has an incredible resistance to chipping. Early years of Le Creuset. The history of Le Creuset spans decades. Le Creuset began manufacturing its award winning porcelain enamel cast iron pots in 1952. In the little town of Fresnoy-le-Grand, the brand slowly grew to become synonymous with France cookware. The French oven, which still remains Le Creuset’s most popular piece today. The masterminds of Le Creuset were Belgian industrialists Octave Aubecq, who was also an enameler and Armand Desaegher; a respected caster. Le Creuset cast-iron cookware ranks alongside some of the other high-end cookware brands of the world. Since its founding in 1952, Le Creuset has used handcrafted techniques that have been passed down through the years. Even today, Le Creuset still utilizes its original processes of forging and casting in all its processes of manufacturing cookware. It maybe more expensive but we think it’s well worth the price. Fine enamelware requires a huge attention to detail. This level of perfectionism is why professional and amateur chefs alike rely on the brand for its aesthetic appeal. In addition Le Cruset is seldom challenged for its level of versatility, its reliability and its trustworthiness. Since Le Creuset cast-iron cookware is designed to be virtually indestructible. This means that it holds sentimental value as it can be passed down from one generation to the next. Through the shifting tides and trends in cookware, Le Creuset cast iron cookware holds a special place because it has supplied a stable background to the ever changing patterns of the culinary world. As such, this has enabled a new and daring breed of chefs and cooks to arise. When the founders first founded the company, the concept they had in mind was simple. 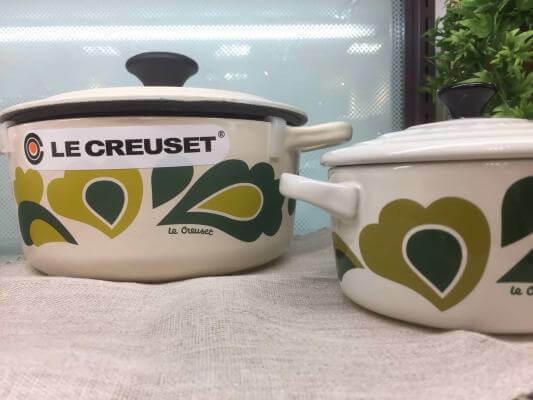 It was to position Le Creuset as the innovative leader of culinary technology and design. 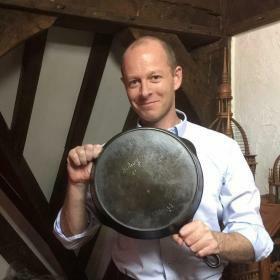 By combining their interest in enameling and casting iron and also their knowledge of consumer psychology, the two unknown Belgians transformed the industry by producing some of the most sought after pots and pans in the world. Why does Le Creuset cast-iron cookware cost the amount it does? Le Creuset still designs and manufactures cast iron in France. The costs of labor and production are higher than you would find in other parts of the world, say China, which is why it costs slightly more than other brands. High quality control and sourcing standards. 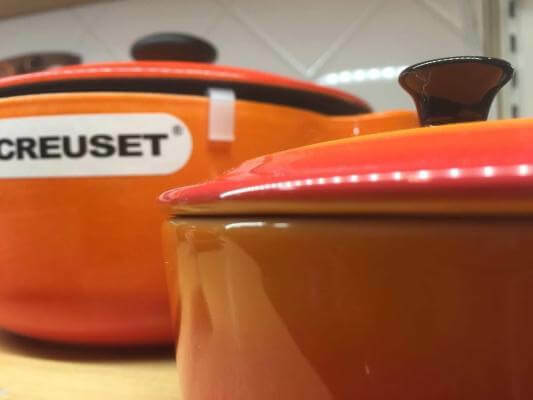 Le Creuset boasts of its years of experience and innovation in the industry. Its cast-iron is created from 15% pure pig iron, 50% recycled iron and also 35% recycled steel. By way of design, the brand’s production style and functionality is so unique that Le Creuset is unlike any other brand of cookware out there. The quality control and sourcing standards alone are so high that the quality of cookware that is consequently delivered is worth the price and investment. Unlike other companies that merely import their resources without verifying their quality first, Le Creuset understands that it takes expertise and resources to continuously make sure that all the cookware produced is of a high quality. This also ensures that the cookware does not contain any harmful or radioactive contaminants. 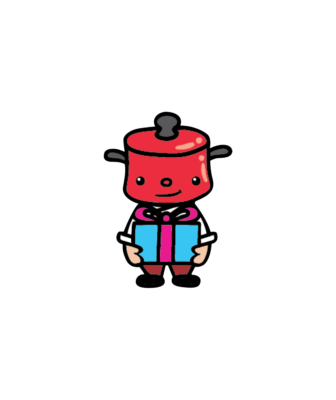 Additionally, the cookware is sturdy and dependable, which means that you will never see a Le Creuset French oven popping rivets or enamel coats cracking as a result of continued usage. Structural failure is unheard of when it comes to Le Creuset cast iron cookware. Unlike many other brands. Owners of Le Creuset love their cookware. Some even collect different colours or special releases. Many owners choose to display their cookware, leaving on the stove or on a shelve. Because consumers say it’s worth it. Since customers have always ranted and raved about Le Creuset cast-iron cookware’s superior quality. Le Creuset cookware is so versatile only one other company comes close to matching its quality and its another French brand. As such, consumers deem Le Creuset worthy and they treasure precious pieces of kitchenware. So in other words, if you are looking for a gift for someone who enjoys cooking, Le Creuset is a great choice. Comparison of Le Creuset cast-iron cookware with other alternative brands. In terms of longevity, cast iron cookware from Le Creuset rivals other brands. Le Creuset cast iron pots are tough as nails! Le Creuset cookware does not need to pre-seasoned, The extra thick enamel glaze protects the cast-iron from rusting and also forms a barrier between metal and food. Which means that you can dive straight into using it immediately after purchasing it. In terms of thermal conductivity, Le Cresuet’s dutch ovens perform better than alternative cheaper brands. In reality, all cast-iron cookware face the same thermal conductivity issues. Thermal conductivity refers to the measure of a material’s capacity to transfer heat from one area to another. The conductivity of cast iron is around a quarter compared to aluminum. This is why Aluminum is often sandwiched between stainless steel cookware which has poor thermal performance when used alone. You may notice a disk like layer on most pans or see terms such as two-ply or three-ply depending on the amount of stainless steel layers used to coat layers of Aluminum. Thermal conductivity means that if you place a cast iron pot on the burner, it will end up forming hot spots on top of where the flame is hottest. While the rest of the pot remains relatively unheated. This is really only an issue when you want to cook a little amount of food quickly such as frying. Most, cast-iron owners let the pan heat-up for a few minutes before cooking. Cast-iron has the best thermal mass performance because of its thickness compared to other cookware. Once heated it cooks more evenly than most other materials. It just takes more time to reach temperature. This this why cast-iron is amazing for slow cooking and meals using liquids. It is still the material of choice for French oven or Dutch ovens even modern alternatives can’t compare. Also with huge thermal mass, cast-iron cookware stays hotter for longer. We love our cast iron, however for some the weight of cast iron is an issue then the Emile Henry ceramic Dutch oven could be your answer. So what sets Le Creuset Dutch ovens apart from alternatives brands? 1. With many sizes available therefore there is a size perfect for every situation. 2. Enameled Cooking Surface makes cleaning easier. 3. 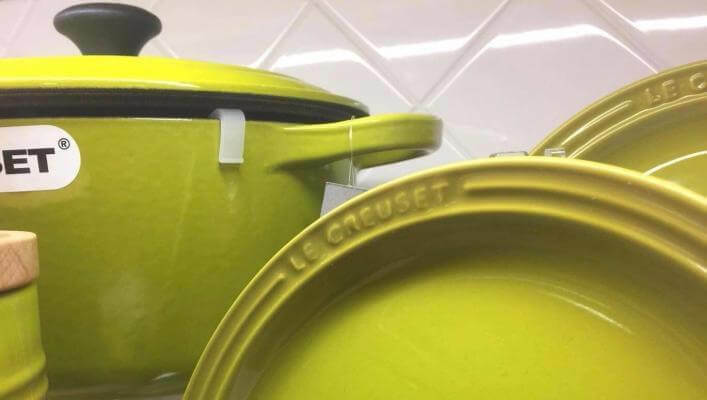 Le Creuset products have a high attention to detail. Each piece is meticulous checked for imperfections. 4. Le Creuset only manufactures high quality products therefore they are one of the most trusted brands in cookware. 5. The colours are so beautiful. Le Creuset make pretty pastels and also brightly coloured shades. 6. 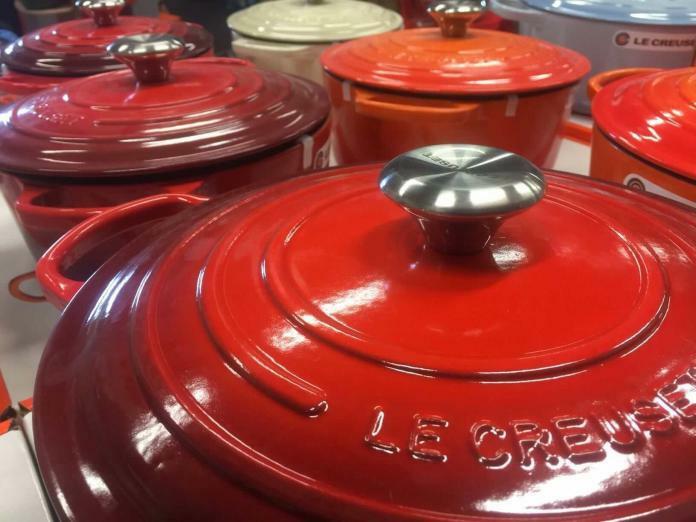 Le Creuset manufactures its cast-iron in France. What sets them apart from other manufactures and therefore one of the most trusted brands in French cookery? Firstly the molds determines the size and shape of the cookware. Then with the use two sand moulds which are securely and patiently fitted together with a little space left between the molds for even heat conductivity. Then raw materials used for the production process, which include pig iron, are melted in a large cauldron, known as Creuset, which is where the brand gets its name from. Once the metal has risen to the correct temperature. The molten metal is then checked for any impurities. In addition the molten metal is checked for the correct combinations of material to Le Creusets recipe. Only when all samples are pass their standard that finally the molten metal can be poured into the molds. Since molten iron is carfully poured into individual sand molds, each piece is unique right from the start process. The shape is cast and then allowed to cool before the finishing process begins. Please note that all cookware created by Le Creuset is unique, because no two pieces share exactly the same features. Once each individual mould is used, it is destroyed and recycled to produce a new mould. Then the cast-iron cookware is finished by hand and sprayed with two coats of enamel glaze at a high temperature an incredible 800°C. This ensures that the exterior is durable enough to withstand any damage that results from regular usage. Next the cookware undergoes a meticulous 12 step verification process that ensures that the final product is flawless and also free from defects to meet the extremely high quality control criteria. Lastly, the finishing process involves cleaning and smoothing the rough edges under the expert hands of craftsmen. Each Le Creuset pieces receives two coats of enamel before the cookware is vitrified to produce the high quality cast iron French oven that you love. At Boonie Hicks we love the heritage and attention to quality that Le Creuset offers. If you would like to know more our cast iron articles offer further insights. Tips for maintaining your Le Creuset Dutch ovens. Before washing your Le Creuset dutch oven, ensure the cast iron cools down for a few minutes before proceeding to clean it. Also do not fill enamelware pans with cold water. Plunging a hot pan in cold water immediately can cause the enamel to crack as a result of thermal shock. If you want to get rid of any food residue, you can try soaking the pan with warm water for close to 20 minutes before proceeding to wash. For cleaning, you should only rely on a brush with soft brittles or soft nylon pads to remove the food deposits. Do not use scourers or abrasive cleaners because they will ultimately affect the quality of the surface. Ensure that your Le Creuset dutch oven is dry before storing it. Always lift your Le Creuset French oven instead of dragging the base across the surface. This will ensure that the cookware serves you for a lifetime. Previous articleYou’ll just adore Le Creuset ceramic cookware, heres why. Next articleIs cast iron too heavy? Try the Emile Henry Dutch oven.